The ability to target one or a small number of cells requires precision control over the environment immediately surrounding a cell. BioPen PRIME and BioPen FLEX systems are unique and powerful microfluidic devices for maintaining a local delivery of molecules to single-cells, enabling control of the chemical environment around single intact cells in tissue or cell cultures. Target just one or a small number of adherent cells to particular compounds, e.g. drugs or antibodies, without diffusion outside the experimental region of interest. The compound can easily be confined. Deliver four different compounds to just a single cell or part of a cell with sub-second exchange time. The four integrated wells containing less than 35 μl, overcome typical dead volume problem of external tubing, reducing significantly the use of expensive reagents. The pipette tip has been optimized to fit into practically any micromanipulation environment allowing combination with other probes such as patch-clamp pipettes, optical fibers or electrodes. The pipette tips are made from a flexible biocompatible material so that unlike glass pipettes they won’t break upon contact with the hard surface. The pipette tip has been developed from an hydrodynamically confined flow principle, enabling contamination-free confinement of one miscible liquid inside another. BioPen® PRIME and BioPen® FLEX Systems are comprised of a high precision pressure controller, a disposable pipette tip inserted in a holder and, PC software. They integrate with common micromanipulators and microscopes. The pipette tip is used to deliver up to 4 different compounds. The pipette tip is made from a flexible medical grade elastomer material so that unlike glass pipettes it won’t break upon contact with a hard surface. It includes 8 wells; 4 wells for containing compounds and 4 wells for collecting waste. Each well can contain up to 35 μl of drugs. Two types of tips are available: PRIME and FLEX. New Sterile PRIME and FLEX pipette tips are now available! Two levels of pneumatic pressure are supplied by the pressure controller and fast solution switching is achieved through the use of miniature solenoid valves. The pipette holder is a pressure manifold to assure a closed system and to connect each solution reservoir of the pipette tip individually with the precision pressure controller. It has been designed to be compatible with any standard type of micromanipulator such as, for example, the PatchStar from Scientifica. Two types of pipette holders are available: PRIME and FLEX. The software enables facile configuration and use of the BioPen® system. The Windows-based BioPen® software allows independent control of each pressure line and compounds delivery. It also includes a scripting module for automation of common tasks and setup/shutdown. “We have a need for the BioPen System to be used for studying variations in cell contractility due to the exposure of certain drugs or combinations of drugs. [The BioPen] is critical for this effort in acquiring large amounts of data. “I chose the BioPen System because I can target precise areas of the cell and see how local and global calcium changes in response to different perturbations. The small size of the area means that multiple sites can be examined in a single muscle cell. 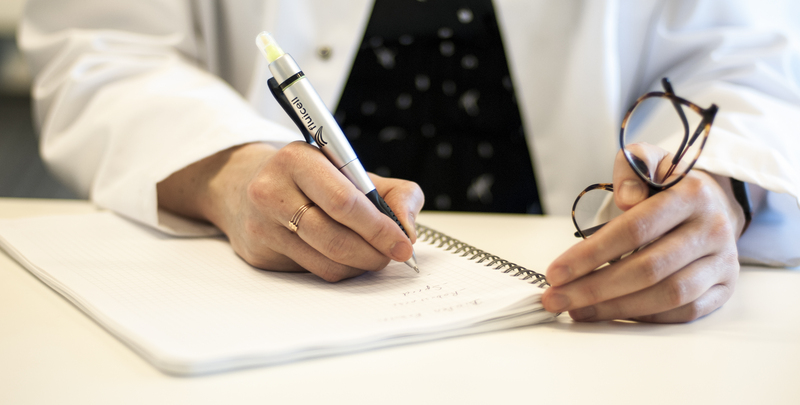 “We have tested the BioPen in different applications here at Karolinska Institutet and in collaboration with a research group at Göteborg University. I consider the BioPen very valuable for applying compounds or drugs to single cells in culture as well as to specific cell layers in brain slices”. The core of our technology is based upon controlling the flow of liquids in very small channels, barely visible to the naked eye. The fabrication of such microminiaturized devices is a delicate process. 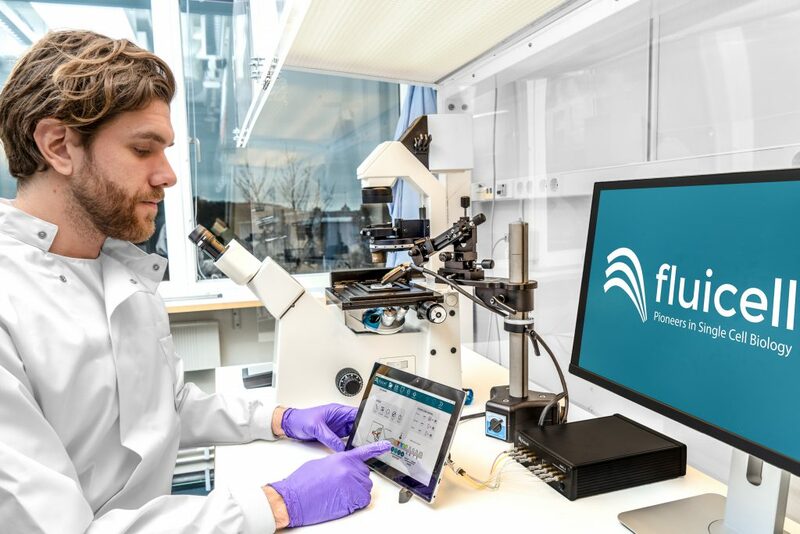 This requires exceptional skill and understanding of microfluidic phenomena, but also attention to detail and years of accumulated processing know-how. Are there any requirements regarding instrumentation, i.e. does this system work with any micromanipulator? The BioPen® System integrates with any standard type of micromanipulator capable of holding a 7mm rod. A micromanipulator is required to position the BioPen within the sample dish. A box of 10 disposable BioPen pipette tips. Two types of tips are available: PRIME and FLEX. Two types of BioPen holders are available: PRIME and FLEX. The PPC1 multichannel pressure controller. A configured touch-screen tablet computer. 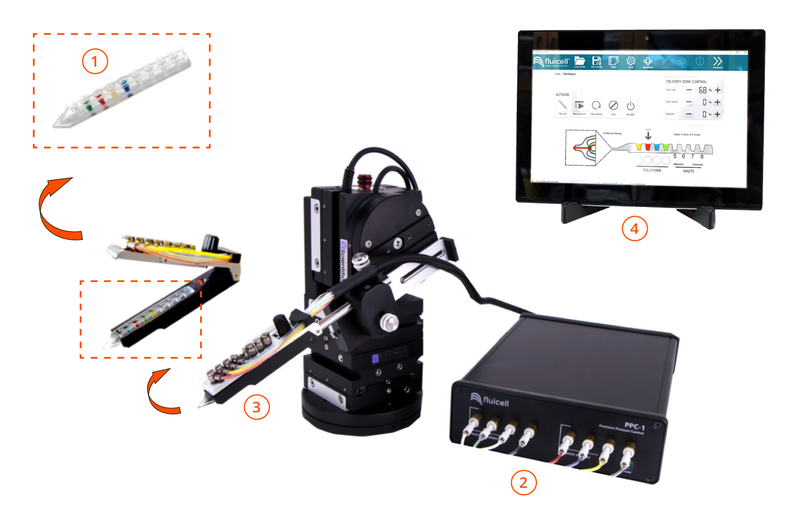 Can the BioPen system be used in an upright microscope? 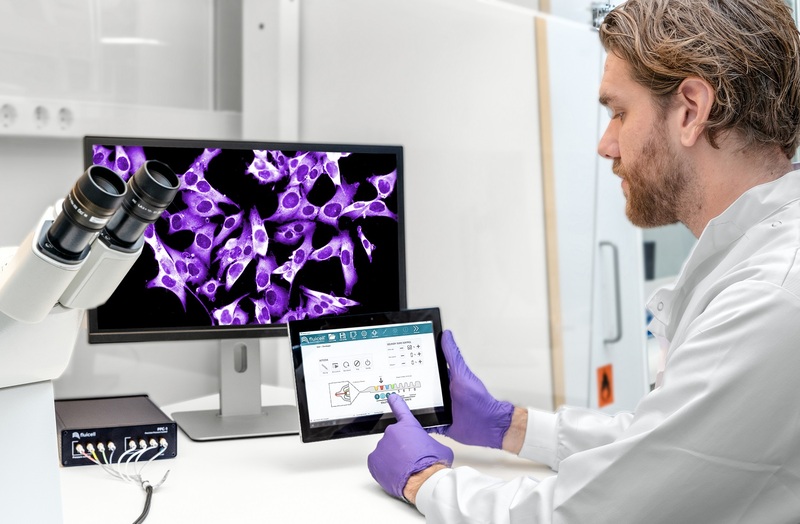 The BioPen FLEX system has been specially designed to work with upright microscopes, requiring a long working distance objective with at least 11 mm of clearance. Depending on required BioPen arrangement angle, we recommend either using larger sample dish is recommended or a shallow wall height dishes. (Common example being WillCo Wells GWST-5040). Can the BioPen system be used with any objective? Yes, in general. On all microscopes, we recommend a lower magnification for initial positioning, which can then be switched to a higher magnification if required. On inverted microscopes, any objective can be used: air or immersion medium, short or long working distance. For upright microscopes long working distance air objectives are required. 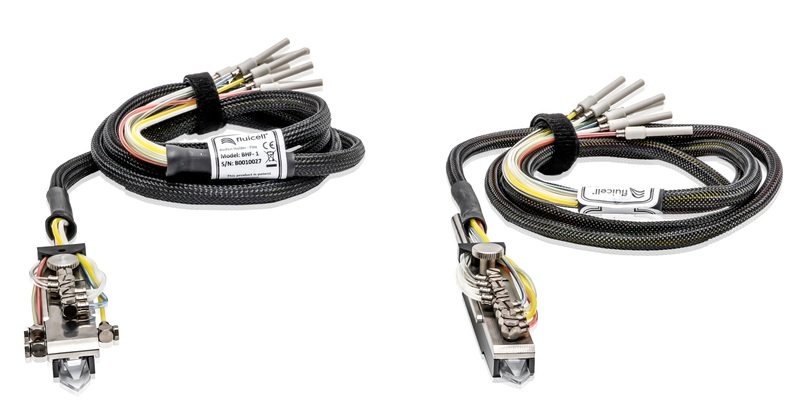 Can the BioPen system be used with other probes? Is it possible to integrate with other equipment or have external triggers? The PPC1 is equipped with both input and output communication capability, through the use of standard 5V TTL signals. Protocols can therefore be initiated by external equipment (such as a camera or amplifier) or trigger signal can be sent to external equipment. The “Rise” or the “Fall” of the trigger can be used, as well as the duration and wait periods can be set within the BioPen Wizard. Can the BioPen system be used within a microscope incubator chamber? Yes, the BioPen system can be used within a microscope incubator chamber. The BioPen holder is made from high-quality stainless-steel components and plastics capable of withstanding a multitude of environments. 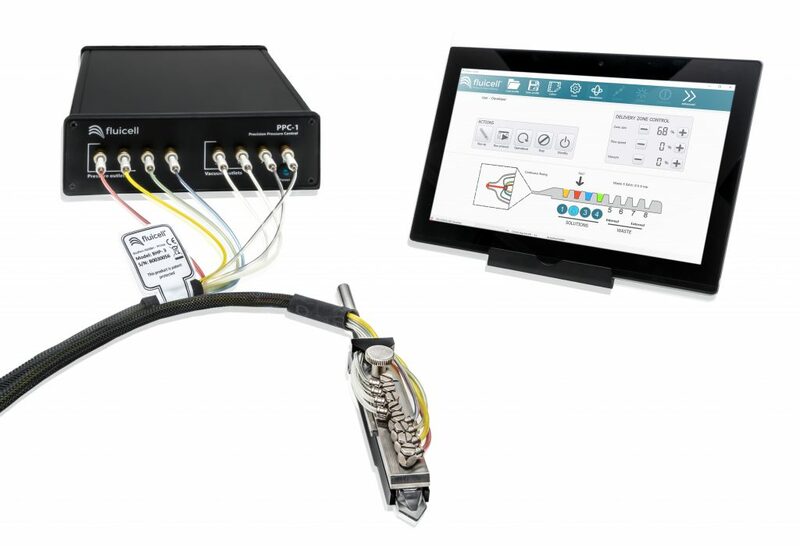 Can the BioPen system be used in sensitive electronics recording environments? The BioPen system can be used in the vicinity and in conjunction to a sensitive electronic detection and recording devices because it is driven by the air pressure, therefore no conductive medium connects the BioPen holder to the surrounding environment. How long does it take to setup the system? To setup the BioPen system and to position correctly the BioPen pipette tip into your sample, it requires approximately 15 minutes. Once the micromanipulator is pre-positioned, future setup times can be shorter. Using established protocols, the priming time for the pipette tip is approximately 5 minutes. How much and how many solutions can I put in one BioPen pipette tip? Each BioPen pipette tip can be loaded with up to 4 different solutions at one time. The BioPen pipette tip contains 8 wells: 4 wells containing solutions for delivery and 4 wells for collection of waste. Each well can contain up to 35 μl of solution, although 20-30 μl is recommended for ease of handling. Less than 10 μl of solution is not recommended, as it is difficult to purge the BioPen pipette tip with such little solution in the well. Liquid must be placed into all 4 solution wells. If fewer than 4 solutions are needed, the remaining solution wells should be filled with a buffer or alternative aqueous solution. What types of solutions are compatible with the BioPen pipette tips? Does it work with high viscosity solutions? BioPen pipette tips are designed to work with any aqueous solution, as long as all 4 solution wells are loaded. All of the loaded solutions should be of approximately the same viscosity to minimize variances in the delivery region when switching between the loaded solutions. BioPen pipette tip can be used with solutions of a viscosity between 1- 500 cP, however higher viscosity solutions should be carefully degassed prior to use, to minimize the possibility of trapping air bubbles within a BioPen tip. Does the BioPen pipette tip have any dead volume? The BioPen pipette tip is designed to have the solution meeting point very close to the sample, almost eliminating any dead volume. The remaining small volume is approximately 0.4 nL for the BioPen pipette tip PRIME and 1.5 nL for the BioPen pipette tip FLEX. The BioPen pipette tips are made of polydimethylsiloxane (PDMS), a flexible medically approved elastomer material. A thin polypropylene film protects the back of the tips when loading into the holder. The BioPen pipette tips, unlike glass pipettes, won’t break upon contact with a hard surface, and accidental contact will not impair the function. What are the advantages of using a disposable fluidic pipette tip? Very minimal clean up times, no cross contamination between experiments (both of solutions and sample dish contaminants) are key advantages to the disposable pipette tips. Sterile pipette tips are also available as an option upon request. How often do the BioPen pipette tips need replacing? To offer a contamination free controlled delivery system, the BioPen pipette tips are designed to be one-time use. Typical usage is up to 6-8 hours, with occasional emptying of the waste wells. Are BioPen pipette tips sterile? Standard BioPen pipette tips are produced in a high precision, low particle environment, using clean room protocols. They undergo multiple stages of visual and solution injection-based quality control steps. The standard BioPen pipette tips are not sterilized, but sterile pipette tips can be offered as an add-on service option, using an independently validated process (RISE). The BioPen is a hydrodynamic confined flow device. What is an hydrodynamic confined flow and what does it look like? A hydrodynamic confined flow device is essentially a flow chamber, where a small volume of fluid is spatially confined within the other, significantly larger fluid volume. The two miscible or immiscible liquids are physically in contact yet separated by means of a virtual boundary. Mixing between the two zones is largely defined by diffusion. The experimental conditions necessary to achieve efficient confinement, while inhibiting diffusion across the virtual boundary, are characterized by low Reynolds and high Péclet numbers. The hydrodynamic flow is a continuous steady state flow with minor fluctuations due to the pressure pump feedback control loop that generates a stable and continuous pressure. How does the delivery of a compound remain localized and does not diffuse to other areas? (positive pressure), where liquid is delivered to the open volume. (negative pressure), through which liquid is drawn in from the sample dish (see figure below). Balancing this inflow and outflow, creates a small perfusion volume or delivery zone at the front of the BioPen tip. 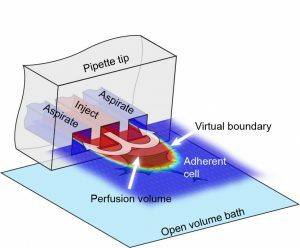 To generate a localized delivery zone, the flow rate of the aspiration port has to be higher than the flow rate of the injection port, such that all fluid leaving the outlet would flow entirely into the neighboring inlet. Flow recirculation provides a mean to maintain a localized delivery volume, which would otherwise rapidly fade by diffusion and contaminate the surroundings. Standard flow conditions are set to have 10 times more inflow than outflow. How big is the area/volume of the delivery zone? In volumes this relates to approximately 0.1 to 1 nL. Are the concentration of the solutions in the wells and the concentration of the solutions delivered the same? The BioPen is flowing compounds directly from the solution well, through an intricate set of fluidic channels, directly to the sample. There is no dilution within the BioPen, therefore the concentrations are the same. How do we visualize the delivery zone? You can visualize the delivery zone using a flow tracer. We recommend Erythrosin B as it is a non-toxic member of the family of fluorescein dyes. It can be easily dissolved in almost any aqueous buffer and is both a colorimetric and fluorescent dye, therefore applicable for brightfield and fluorescent microscopes. What is the fastest time the solution can be exchanged within the delivery zone? This depends on the BioPen setup; solution speed, positioning to the sample, etc. Under typical operation, complete exchange time within the zone, is less than 1 second. Can any type of cell be employed? What type of cells can be used? Any type of cells can be used as long as they are surface adherent cells or held by a probe e.g. patch-clamped cells. Can several cells be targeted at once? Yes, you can target one or a small number of cells. The number of cells that you can target depends of the size of your target area. For complete exposure, the target area should not exceed the delivery zone size, that is created by the BioPen system. How is the cell affected by the flow? The cell is affected minimally by the flow since the BioPen System creates negligible flow shear stress. What are the main application areas for the BioPen system? The BioPen is a very flexible tool for localized compound delivery. It can be employed almost anywhere when there is a need to deliver compounds to confined area and volume, especially useful when delivering compounds to individual cells. Download the Application Notes for more details. Do you have any publications using the BioPen system? What are the key features of the software? The BioPen Wizard is the control software for the BioPen system. It enables users of all experience levels to have direct control over spatial and temporal test solution delivery to individual or group of cells. Does it work on any computer? What are system requirements? It works with any PC running Microsoft Windows 10 and 7 (both 32 or 64 bit) with an available USB 2.0 (or above) port.